My Kids Stole My Brain: Who else has that "FRIDAY FEELING"? Oh, to be 3 and carefree again! Those were the days! This right here folks, perfectly sums up what it means to have that "FRIDAY FEELING!" T.G.I.F. 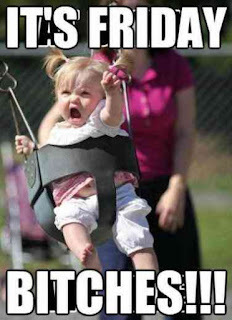 Thank God (or goodness, whatever you prefer) IT'S FRIDAY!!! "FAV FRIDAY FUN FACTS & STUFF!!!" There is roughly a 1 in 30 chance that a person is born on the 13th day of any given month. There is a 1 in 7 chance that a person's 13th birthday falls on a Friday. Multiplying these two probabilities, 7 times 30 = roughly 1 in 210 chance that a person's 13th birthday occurs on Friday the 13th. 4. 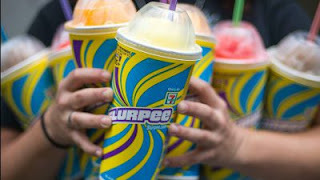 One of my FAVORITE FRIDAY traditions is a middle school rite of passage around these parts: FRIDAY SLURPEES at 7-Eleven afterschool, followed by a GOLF CART ride in the 'hood! 5. Another awesome Friday tradition started by our very good family friends is "PANCAKE FRIDAYS!" All the kids look forward to these special mornings when they are invited to a before-school pancake breakfast where they eat scarf down flapjacks, swig some OJ and have some time to hang out and do what tweens and teenagers do. These fall on the final Friday of every month. THEY ARE AWESOME! I may be slightly obsessed #FITZMAGIC #GOBUCS!